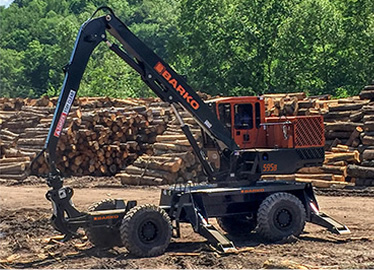 The Rough Terrain Carrier (RTC) loader package is the most maneuverable and powerful log loading machine in the Barko lineup, providing increased productivity while maintaining a safe work environment. 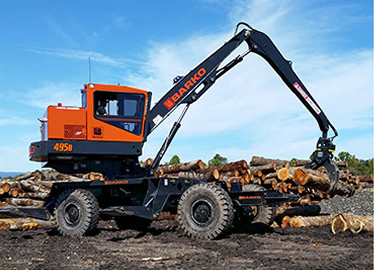 With a rigid frame design that provides a sharp turning radius and incredible pulling capacity, the RTC is ideal for navigating around log yards, sawmills and other tight jobsites. 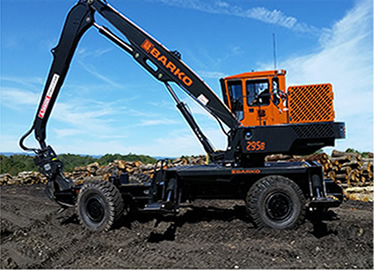 The Barko 295B RTC packs ample power into a compact package, while pilot operated controls and enhanced serviceability contribute to exceptional operating efficiency. Delivering tried-and-true Barko technology and powerful swing torque, the 495B RTC offers agility and tractive effort to get around quickly and make fast work of loading tasks to save time and money. Engineered for maximum dependability and productivity, the 595B RTC features an incredibly stable rigid frame, and boom options up to 40 feet, to propel your loading to a whole new level.